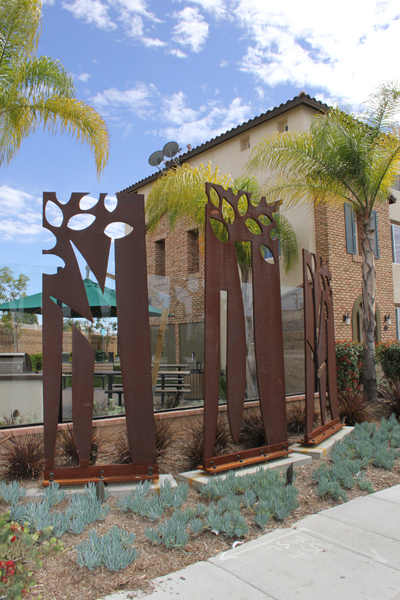 “The Family Tree,” by Daniela Mocan, is composed of three corten steel panels ranging in height from 7 to 9 feet tall and measuring 2-1/2 inches thick. The panels are finished in a natural rust patina and jet cut in a stylized contemporary fashion to reflect a family of trees, symbolizing strength, endurance, growth and family. The artwork is enhanced with lush landscaping and lighting that plays against the positive and negative spaces of the artwork. Lights are situated in front of and behind the art piece and are programmed to alternate from the front to the back sides at three- to five-minute intervals. 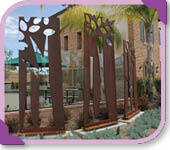 “The Family Tree” was created for the Cerritos Plaza Walk development, owned by the Olson Company. Mocan has an extensive background in the arts and has worked with the Olson Company on a number of its residential projects. Mocan’s inspiration is often taken from nature and translated into simple artistic forms that further enhance the environment.